FURY (Noun): unrelenting ruthlessness and rage; pure intensity and determination, mixed with anger. Nope that is not me, the name was derived from a Brad Pitt movie https://en.wikipedia.org/wiki/Fury_(2014_film) where I was very much impressed by how the actors were emotionally attached to the tank named Fury. About Myself: A typical Bangalore resident for the past 25 years, with exposure to various cultures and lifestyles due to the vast number of people present here from all over India. The core Bangalorean's will agree with my point. With dad being a mechanic, I was automatically inclined to the automotive field from a early age. Forget about learning from dad, he would never even let me close to the garage and he always used to tell me "Don't get your hand's dirty". Well that was a bummer, eventually completed my studies in the Automobile sector Surprise Surprise. 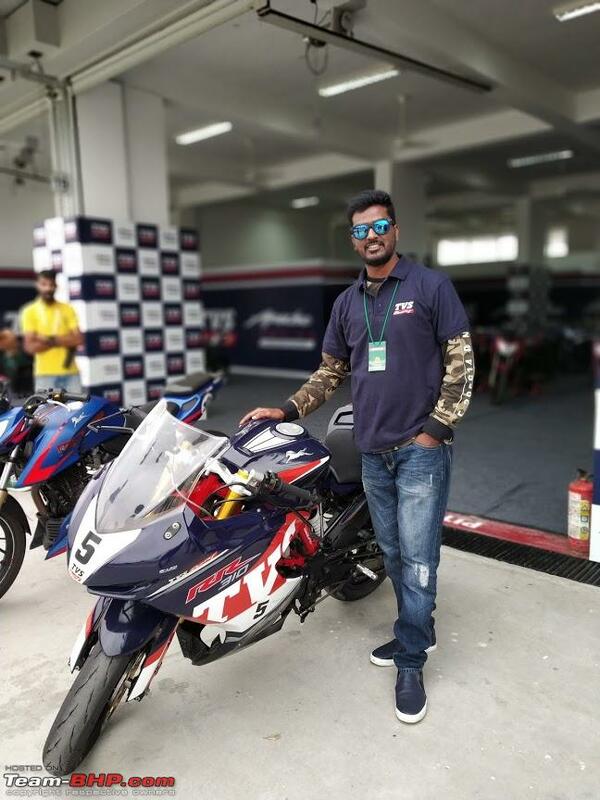 Due to limited scope of the Automotive Industry in Bangalore, I too took the plunge and I am presently working for the IT industry. The Itch: Although I am currently working for an IT company, I had worked with TVS for a mere 3 months and couple of other companies before I quit the industry. Never even in my wildest dreams had I imagined of owning a TVS bike. I was always a Hamara Bajaj guy,thank you P220. Ok coming back to the itch, it all started with the Dominor review by IronH4WK I was so sold to that review, that I had decided my next bike would be the D400. 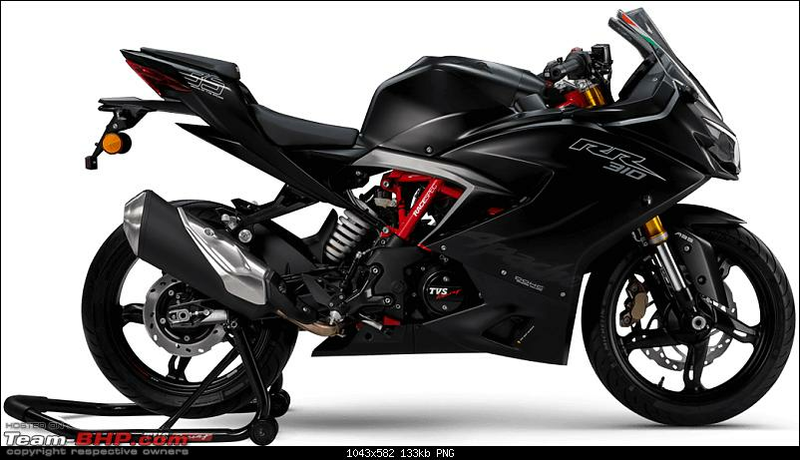 With it's unbelievable pricing and also the big bike look it was easy to convince my parent's to finance me. So all said and done let's book the D400. Well it's not that simple, like many other youngsters of my age I was also a big fan of Moto GP. No not the #46 but someone older and wiser, Casey Stoner and his taunting red Ducati. Never missed a race even if it was a early morning one, just to see him rip the track. 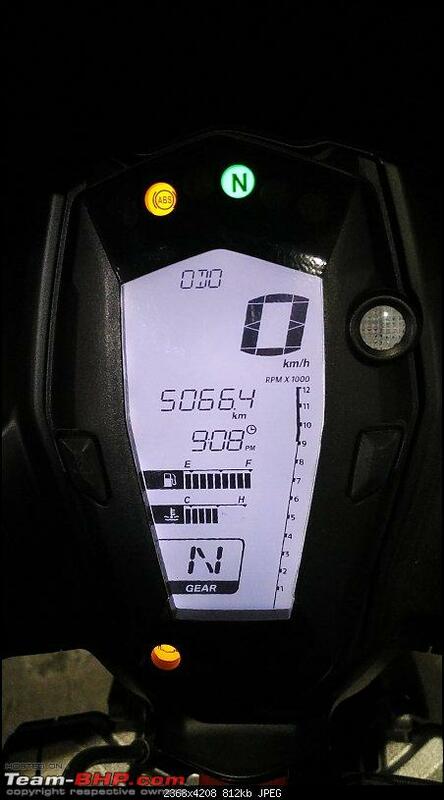 With this history of mine, how can I choose a naked motorcycle which is eventually my next big upgrade??. If you haven't guessed it, yes I had a severe OCD for fully faired bikes. So now what?? Oh this is a long one. D400 - Thank You IronH4WK. No more comments on that. 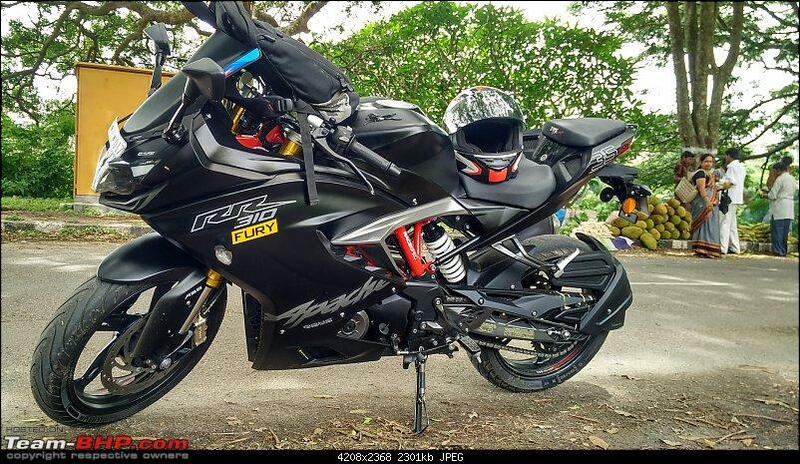 KTM RC 200 - With D400 being a 373cc bike, Duke 200 was never really considered cause I was looking for 250cc+ motorcycle. But I kept it aside as the last option cause yes it's a fully faired bike. 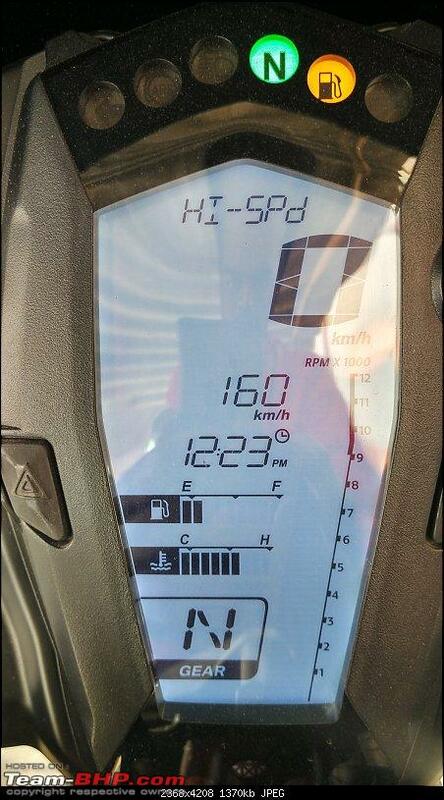 KTM RC 390 - Nope, too much power. 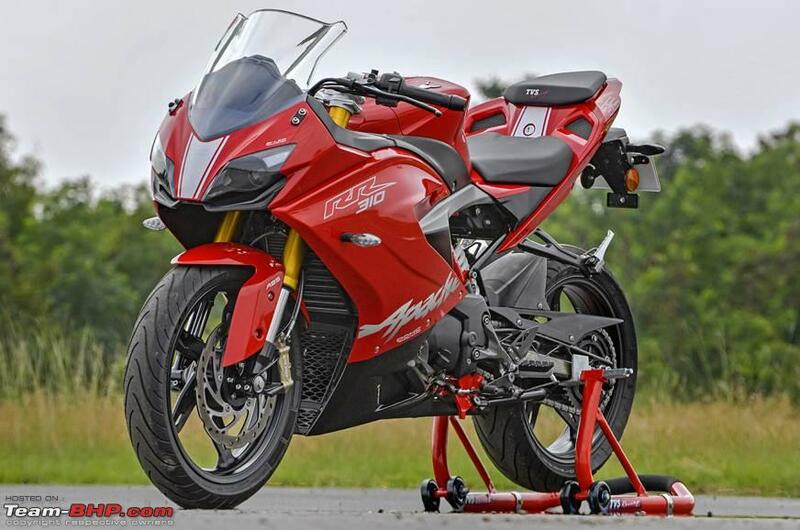 CBR250 - Honda's legendary reliability and cheap maintenance costs. I really had hoped Honda would launch the updated version at the end of 2017. Was eagerly looking forward, but it never came. With a budget in hand of 1.5L - 2L max for the ABS version of the D400, and also with the pressure of parent's loosing interest. I had no other option. 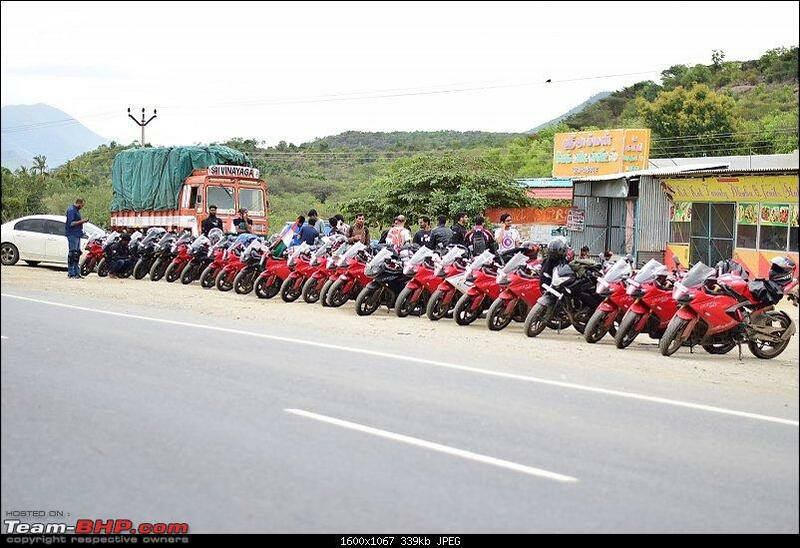 I would regularly travel on the Hosur - Thally road as I had a client whom I visit couple of times a month. TVS Motors tests their vehicles on this road has it's very neatly done, with less public and also cause it is close to their factory. 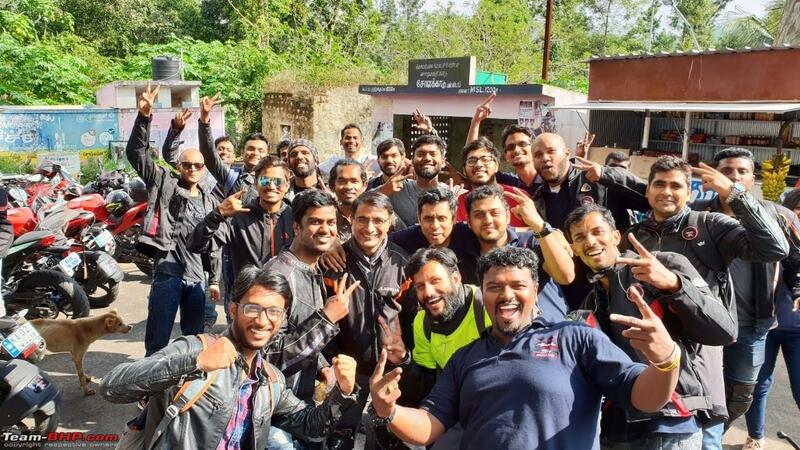 I was aware of the TVS-BMW partnership and knew that they were working on a bike for the Indian market, but had no real expectations from them. On one of my visits to the area I see couple of TVS test riders in full gear on a fully camouflaged bike overtake me in quick succession and disappear ahead. The only thing I could make out was the exhaust note (Yes it was not the present one). So I finish my work and was returning back home when I see the same riders ripping the open roads in tandem. That was when it flashed to me, this must be the Akula concept which TVS had showcased. Once again the exhaust note. The Akula - TVS here literally screwed the meaning of the word "Concept"
With the uncertainty looming large on Honda launching the upgraded CBR250, it was a very confusing period for me and my family. I would literally change my decision every fortnight as to wait for the CBR250 or just go for the D400 with a heavy heart. I had a deadline till the end of the year or else it was uncertain when the next opportunity for buying a bike would come. 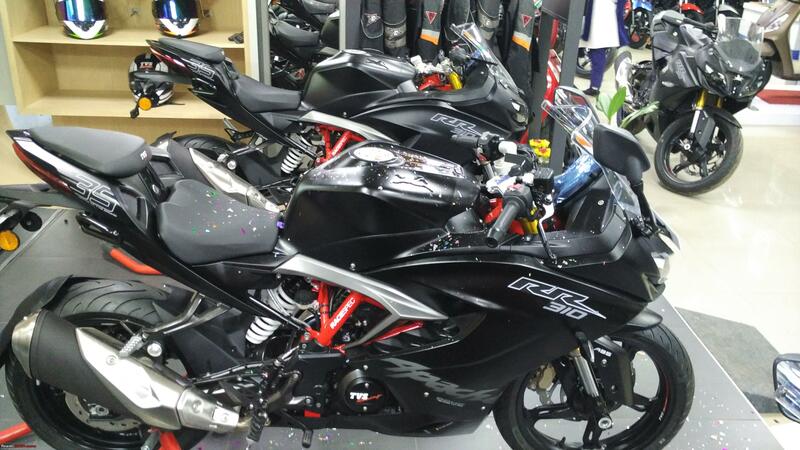 TVS had announced with a couple of teaser shots on social media that it would be launching the Akula on Dec 6th. The announcement came out of nowhere, all of a sudden I was very excited at the same time very nervous on the pricing point. I had anticipated that this would be a +2L product and there is no way it would be launched lesser than that. 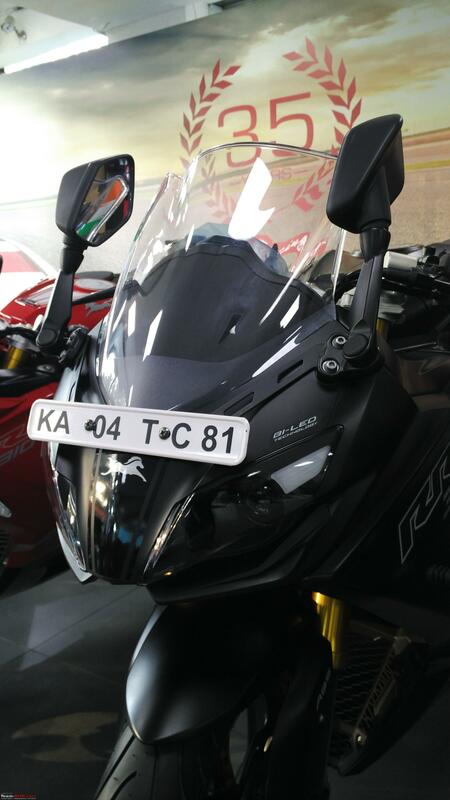 Akula was rebaged and launched as the TVS Apache RR310 on Dec 6th 2017 at an ex showroom price of 2.05L. If the concept was surreal, take a look at this beauty. 2.05L ex showroom was still do-able, on road price in Bangalore would have come around 2.5L. After 10 days of launch the price was increased to 2.15L ex showroom in Bangalore and many other major cities, with Kerala being the cheapest at 1.99L. Come on TVS, you are killing a dream here. 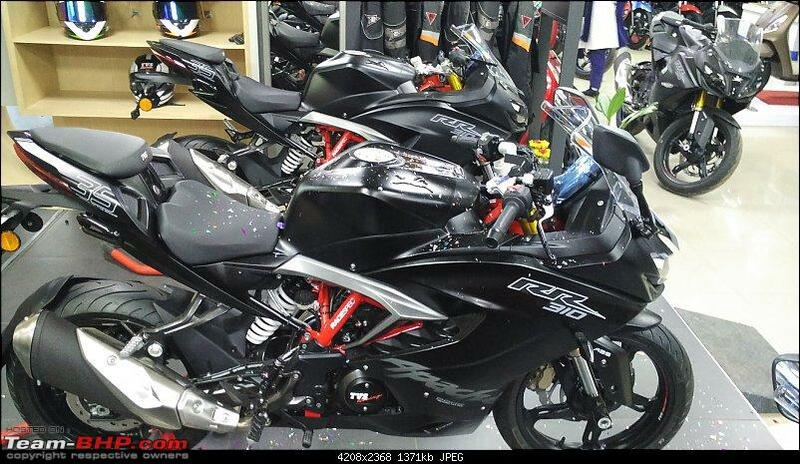 I had managed to convince at home by showing them the pictures of the bike before revealing the price. 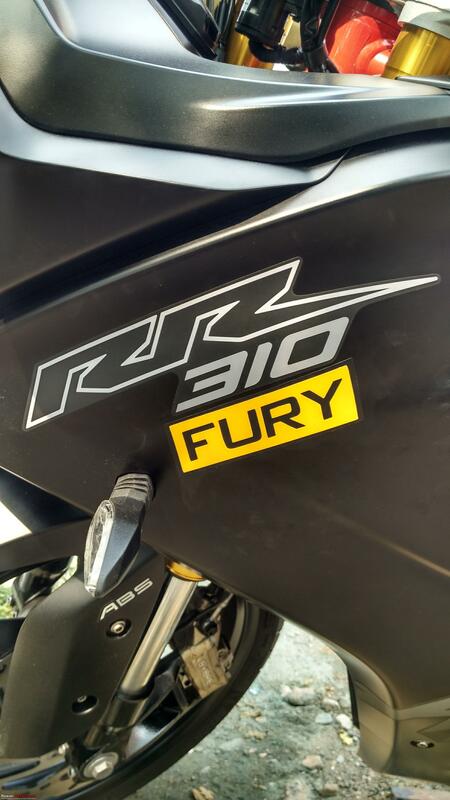 By this time I had gone through numerous photos and videos which were are all praise for the Apache RR310 looks and feels and I was also eagerly following Tbhp for first hand information on display bikes available in Bangalore. 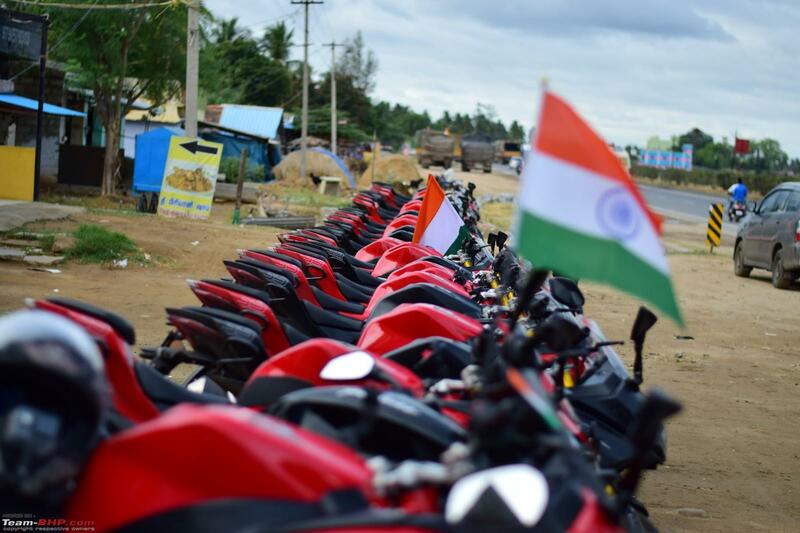 The first set of display bikes reached Bharath TVS, Jaynagar and Solar TVS, RR Nagar in the first week of January. Since Solar TVS was the closest I booked the bike by paying Rs.10,000/- on January 13th pushing the sales person for a first lot delivery. In the meantime Prakruthi TVS, Ganganagar had received the display bikes on Jan 14th just after I had made the booking at Solar. 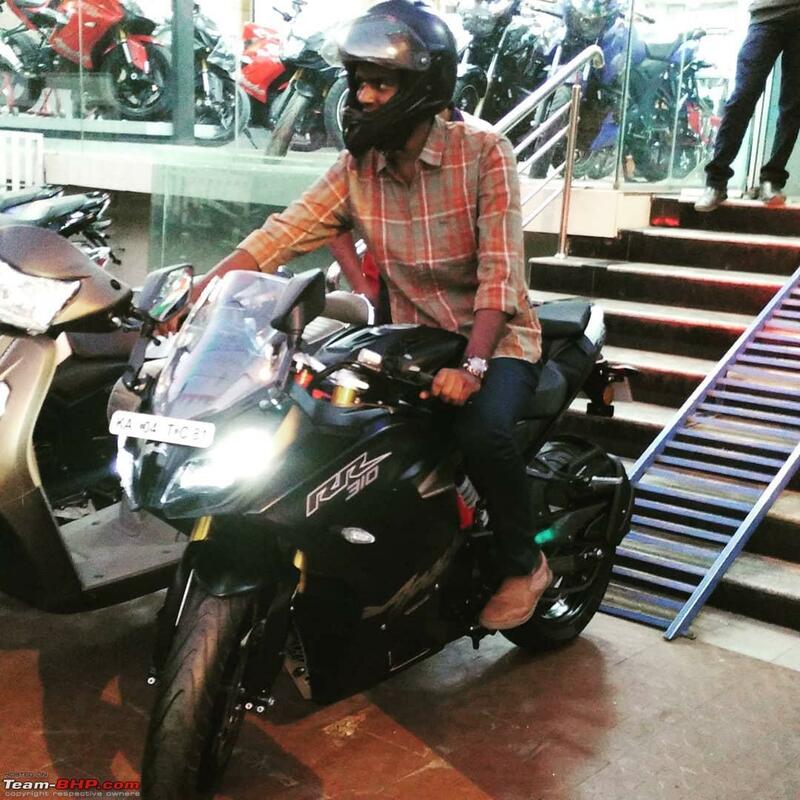 First set of pictures with the bike at Solar TVS, RR Nagar. I had requested the sales person at Solar for a first lot bike or a delivery by the end of February, since it was my birthday month I kinda wanted to gift myself with this beauty. He had committed me a delivery only by the first week of March and after multiple requests I had to cancel the booking at Solar TVS. 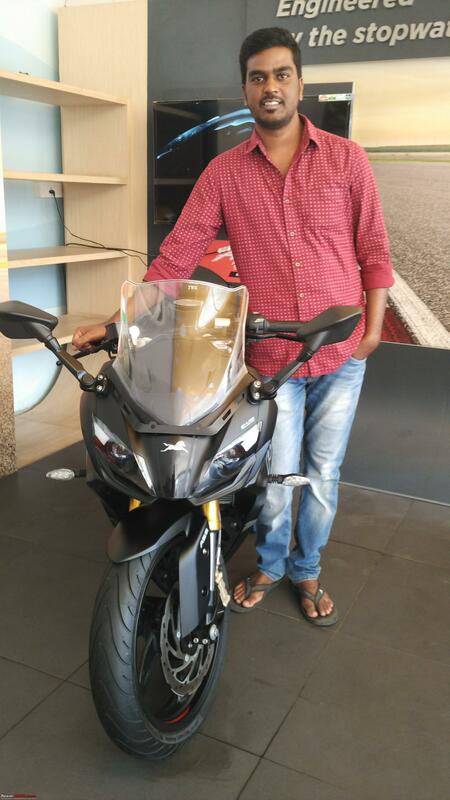 In the meantime I made a visit to Prakruthi TVS to check the display bikes and also to try my luck on a February delivery. The sales person connected me to a higher level official and I explained to him of how important this was to me. He eventually agreed (JACKPOT!!!) since the Matte Black was not in much demand compared to the Racing Red, those who had booked earlier were also waiting for loan approvals. Last edited by FURY_44 : 1st February 2019 at 09:45. It has been 5 months since I started looking for a bike, after multiple sleepless nights and quite a few twists and turns. The D DAY was finally fixed on the 5th of February (What a way to start Monday!! LOL). Delivery was scheduled in the evening, spent my day dreaming about the foreseeable future. Reached the showroom at around 5:30 PM to complete pending payments, handed over documents for the RC and Insurance. The feeling was slowly but definitely sinking in. & the full view. What a stunning machine !!! 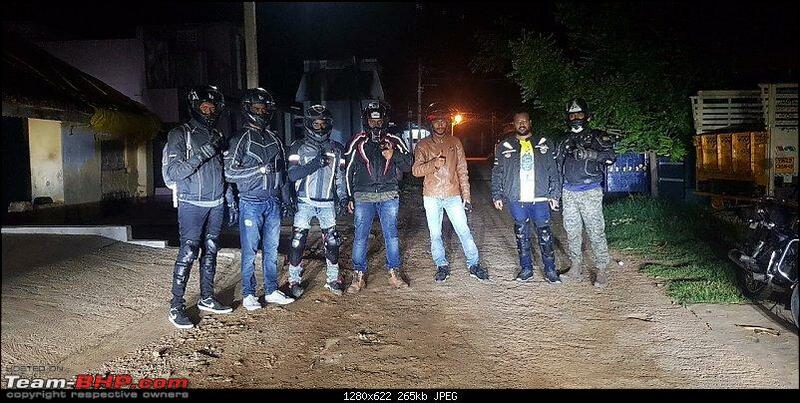 By this time I came in touch with Bhpian Athek who also got his bike delivered from Prakruthi TVS in the month of January. 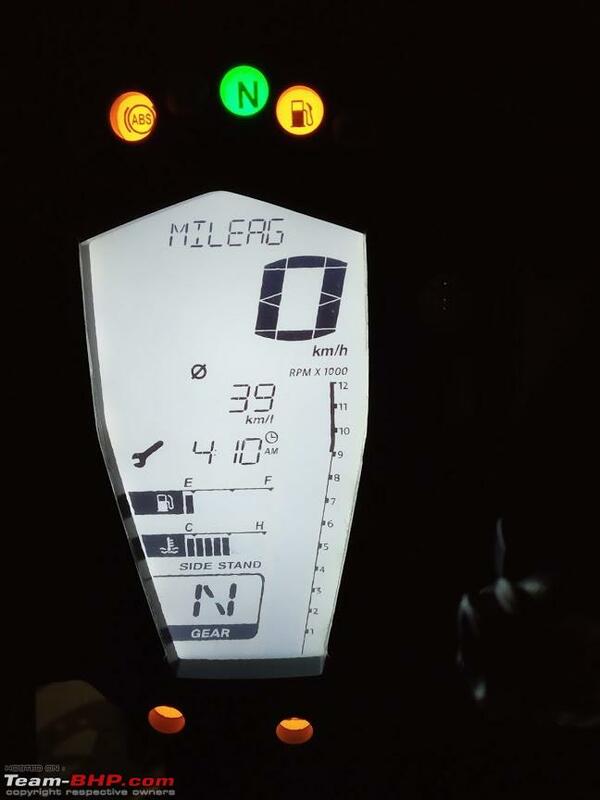 As the bike was practically very new and no one had much knowledge about the bikes functionalities (Heck I didn't even know if my exhaust sounded right). We created a Whatsapp group for the early owners to hear about their experiences and also to discuss if any issues have been faced. Last edited by FURY_44 : 1st February 2019 at 10:06. 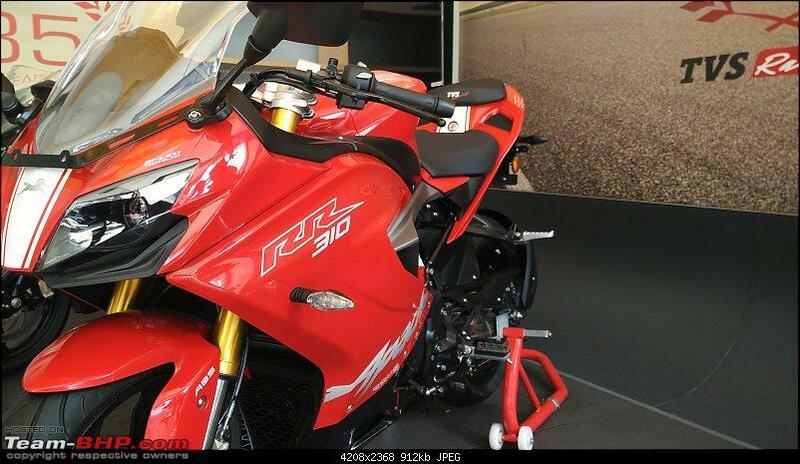 I will not be going through the technical details of the bike, since it's already available everywhere. To put it in simple words, I'm bad at Math Instead I will be covering the servicing aspect of the bike focusing on parts changed, service cost inccured and also issues faced. 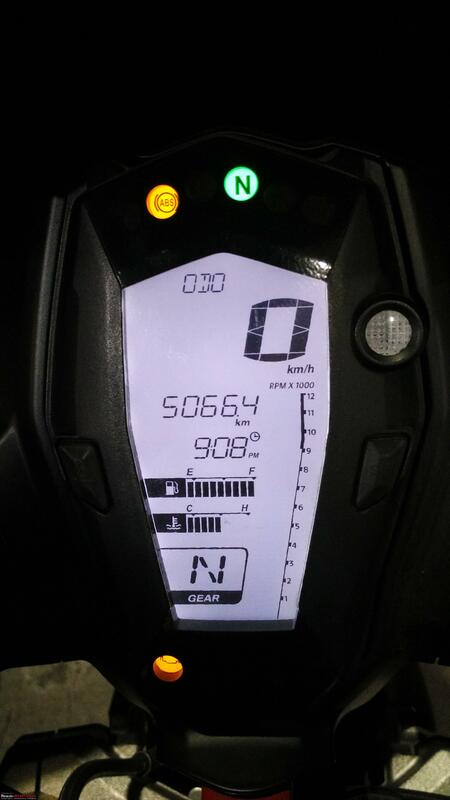 The first 1000 kms took me two months, as I had a very cautious approach. We had a small group ride in between, where 5-6 initial owners had joined and we had a general discussion about the bikes. First service was done at Prakruthi TVS Ganganagar, where I met Mr Shashi who is exclusively trained and allotted for the RR310. The next 4000 kms were quickly covered in a gap of 4 months with multiple breakfast and long distance rides organized by the group. 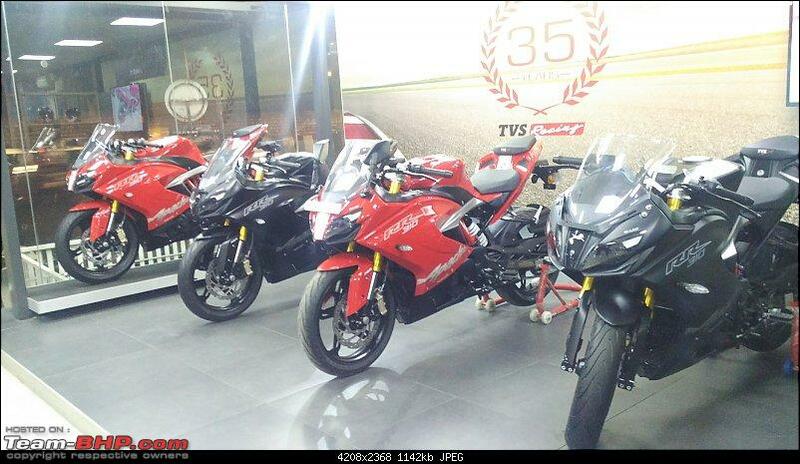 Eventually more and more owners were being added to the group from various showrooms across Bangalore. 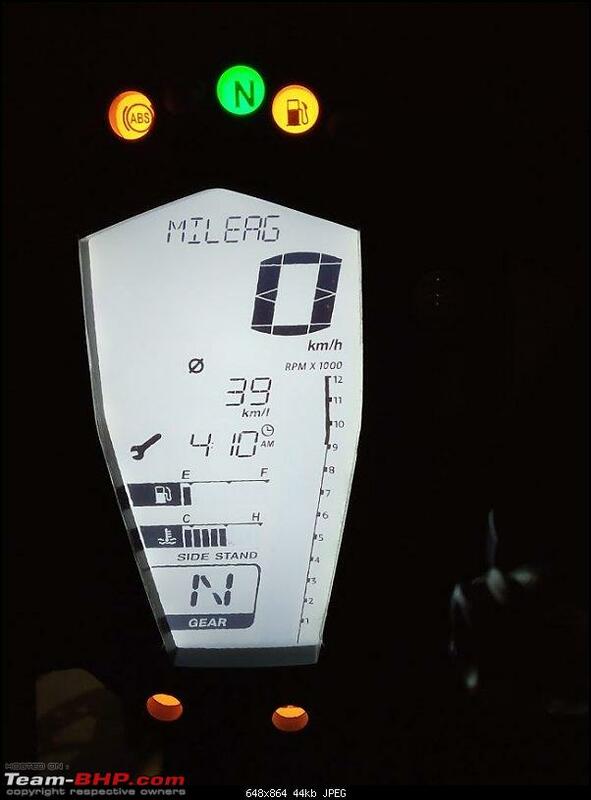 Issues faced at 5000 kms: The handle bars were vibrating a bit out of the comfort zone and poor mirror visibility after 100 km/hr. Solution provided: Heavier bar end weights have been provided by TVS which has helped a lot in tackling the handle bar vibration. 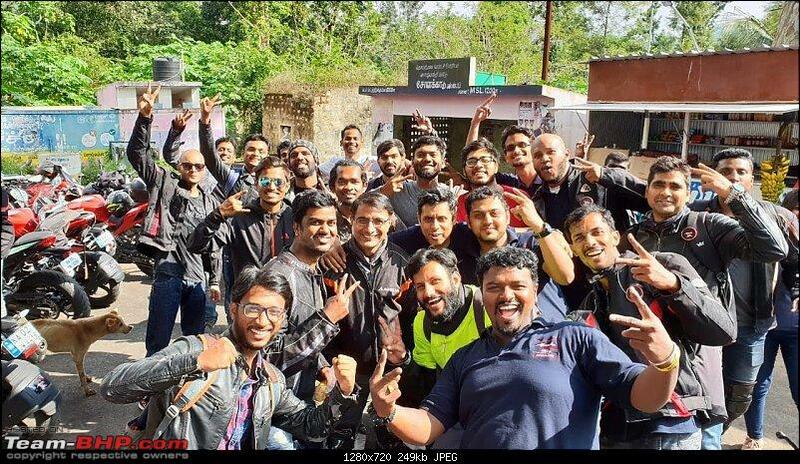 Almost a year and 10,000 kms later, the bike as literally evolved from being the new kid on the block, to being criticized for various issues, to again being featured in news articles for some really positive long term reports. 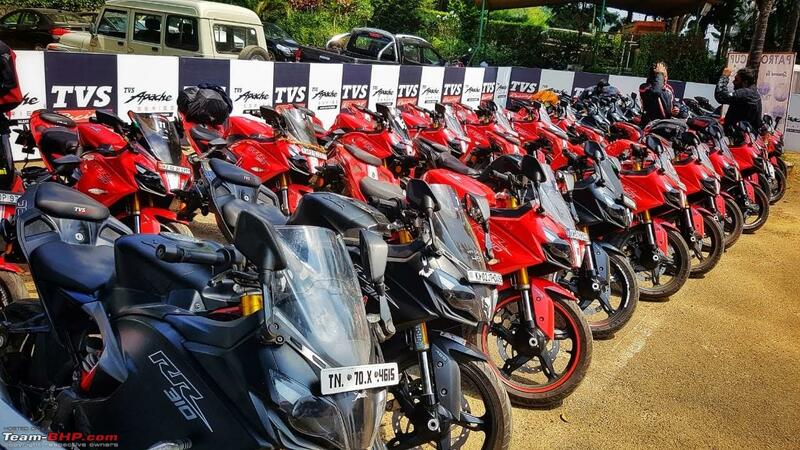 As a first lot owner I agree that there were initial niggles in some of the bikes from different lots, what I did not expect was TVS addressing all the issues with patience and constantly coming up with a solution. There have been cases where TVS have sent technical persons to the owners residence to sort out the problems faced. Issues faced at 10,000 kms: The front side fairing near the visor was making a rattling noise after 90km/hr and poor mirror visibility after 100 km/hr. Solution Provided: Visor cushion has been provided by TVS which is placed in the gap between the visor and the body panel. No solution has been provided for the poor mirror visibility as of now. Last edited by FURY_44 : 31st January 2019 at 13:20. Completed the TTD trip with impressive numbers. 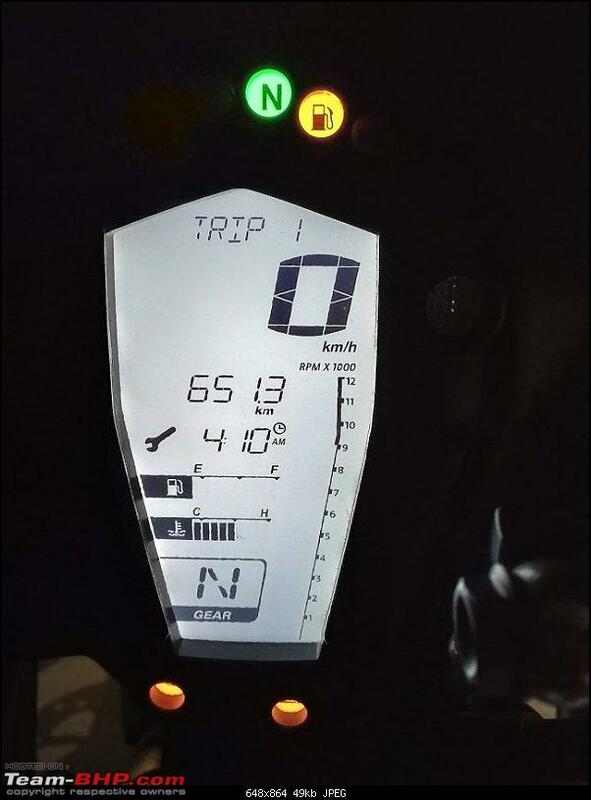 Another part where the RR excels is mileage, if one rides at sane speeds. The owners group was invited for a track day at MMRT to watch the final race of the national and one make championships. 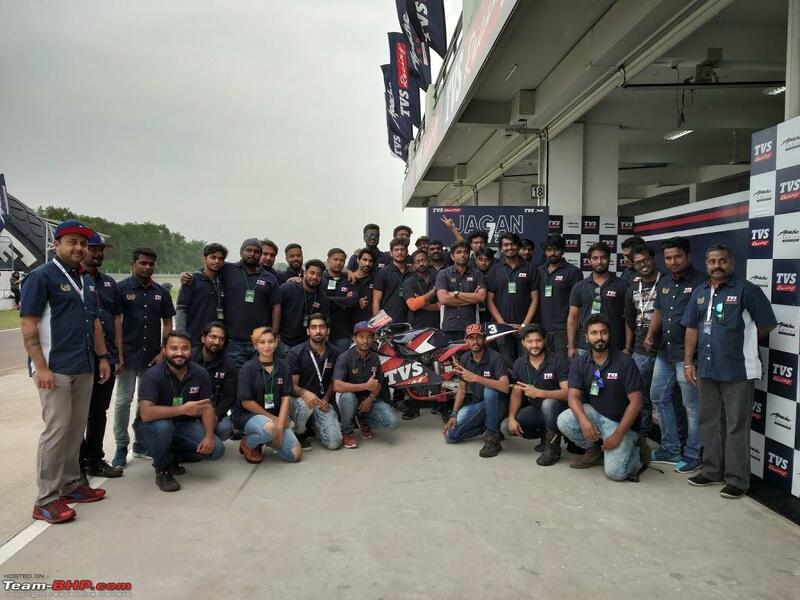 After the final rounds were done, exclusive pit entry was given for the whole team. 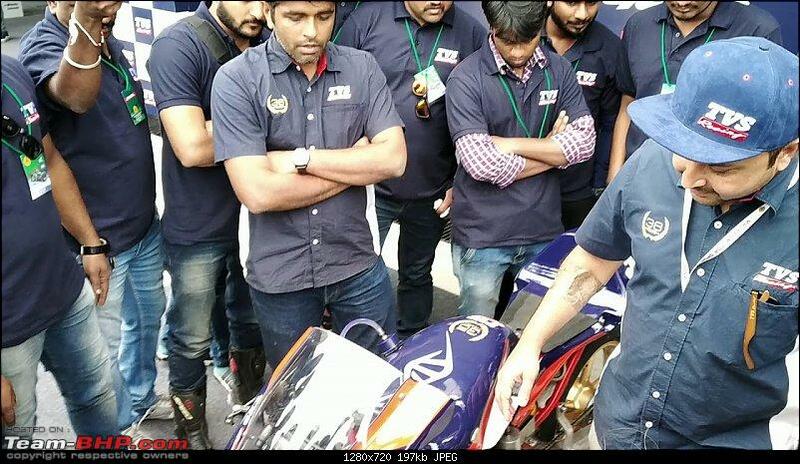 Mr Pradeep from TVS Racing took time in explaining us through what goes in to make these machines race ready. Last edited by FURY_44 : 1st February 2019 at 09:37. Usage: Strictly restricted to highways,average of 1000 km's per month. 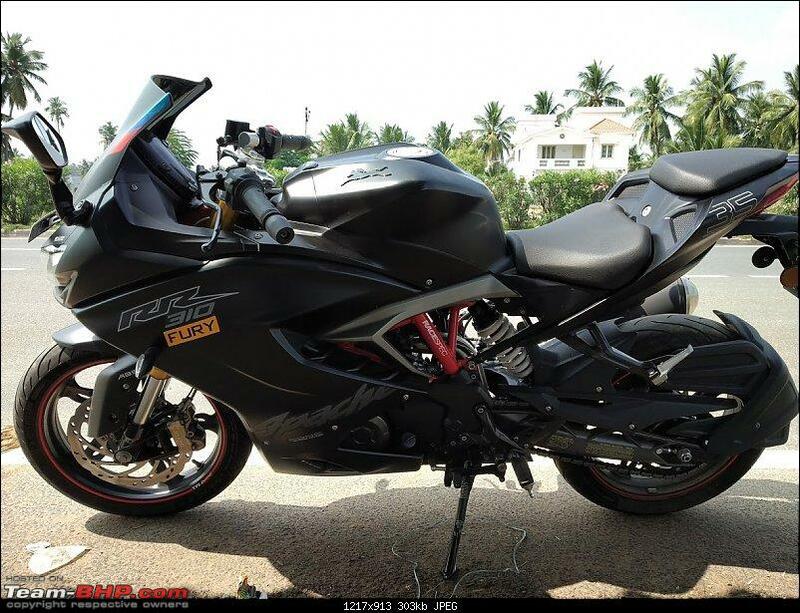 -Definitely the best looking fully faired motorcycle by an Indian manufacturer. -Reverse inclined DOHC engine helps in middling the COG of the vehicle. -Mini Computer or the Instrument Cluster is filled with abundant information. 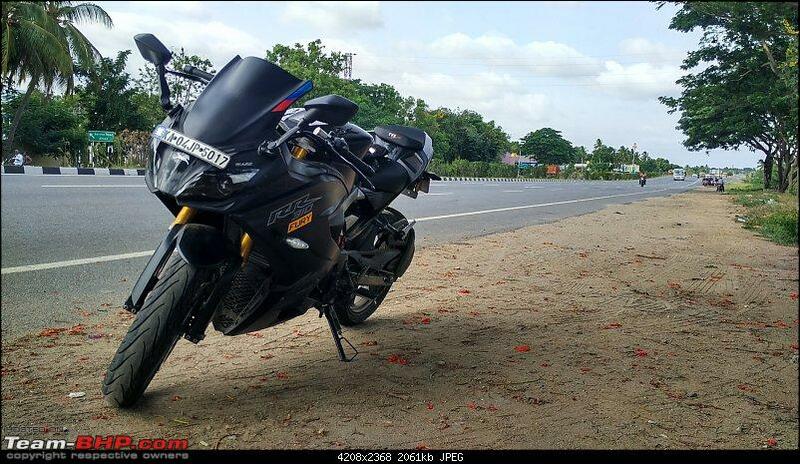 -Riding posture is neither too committed nor upright, it is bang in the middle. 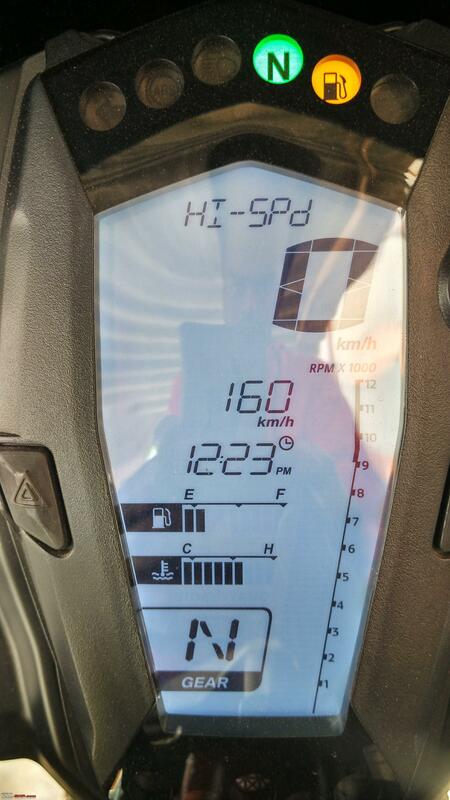 -Fuel efficient engine (Max 47 km/ltr, Min 29 km/ltr is what I have managed). -Riders seat is very comfortable and roomy to move around, which results in more distance covered without aching your back. -Foot pegs are not rear set. -Easily flickable in b2b traffic. 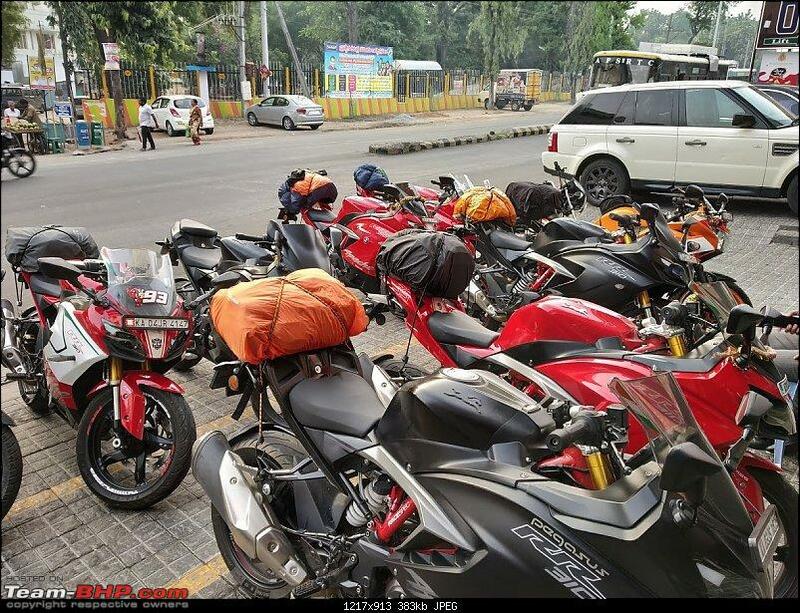 -Pillion seat is strictly restricted to bungee cords and baggage's. 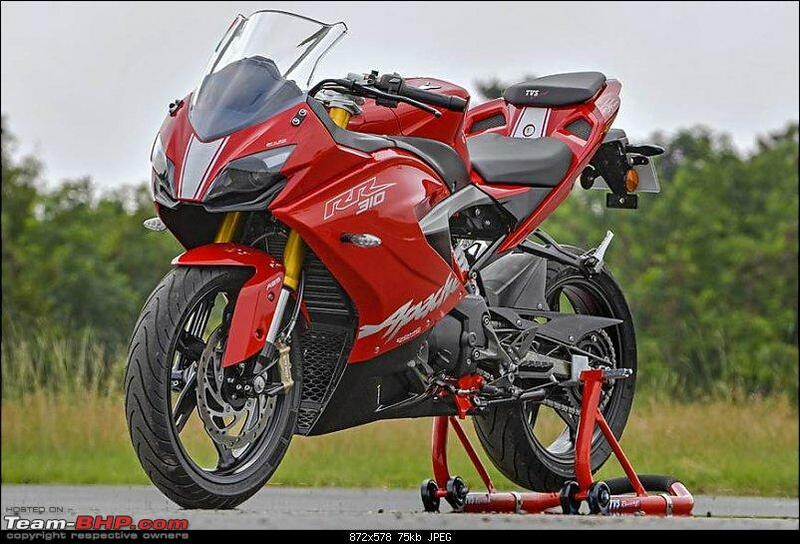 -Mild vibrations from foot pegs, handle bars and seat at 6k rpm. 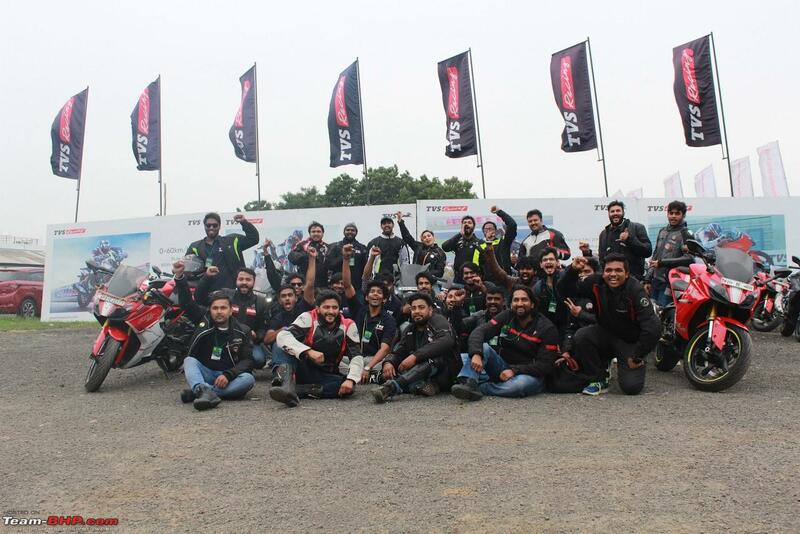 -Lack of slipper clutch takes out the fun in riding on hilly terrain and corners. 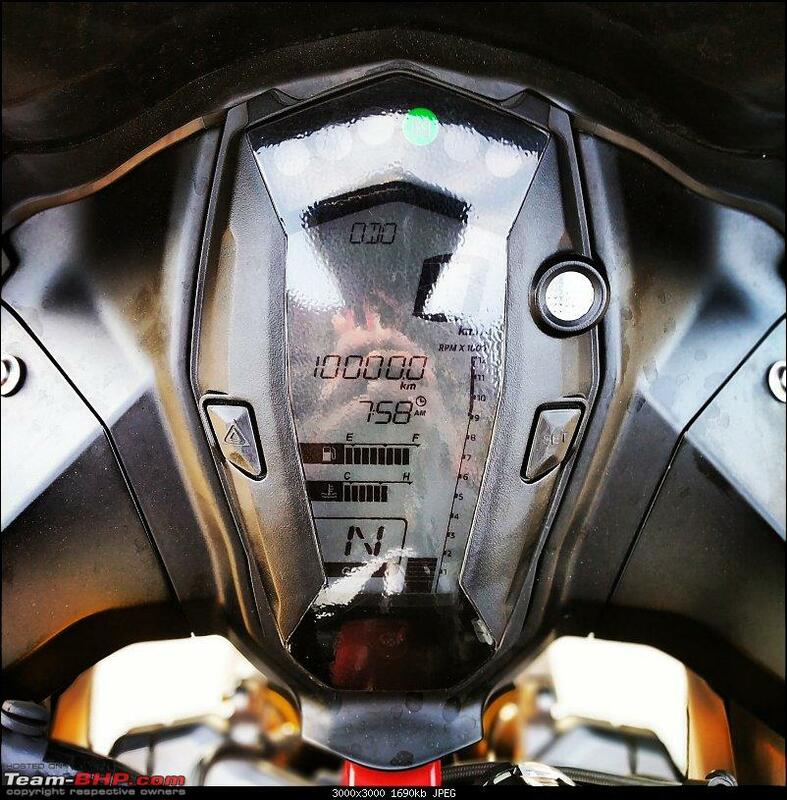 -Although the instrument cluster is loaded with information, it is not colourful. -Mirrors are useless post the 100 mark. 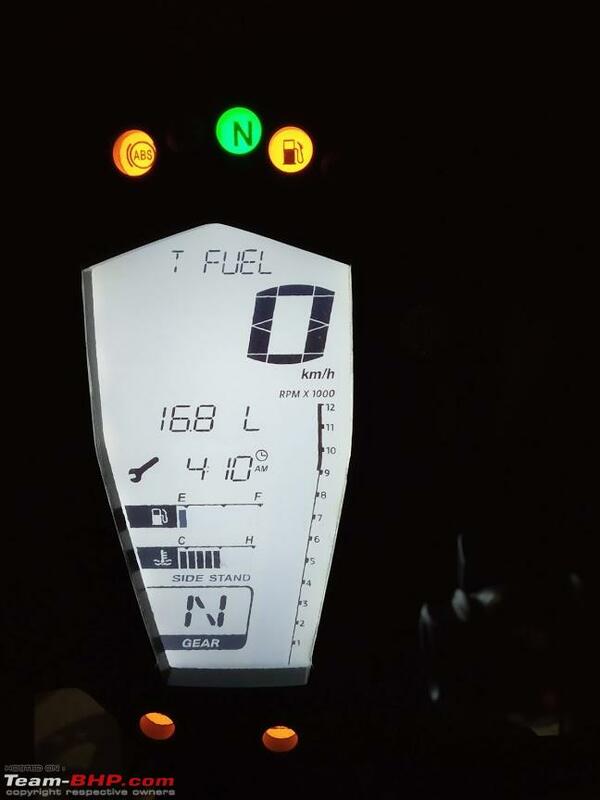 -Fuel tank capacity of just 11 ltrs. -Exposed Radiator, leading to bent fins. The RR 310 has been restricted to highway use only, since I am comfortable with a moped in Bangalore traffic. It does not mean that the RR 310 is very difficult to move within the city, in fact I don't feel any difficulty at all in maneuvering the bike once it gets moving. It is very easily flick able in b2b traffic and it also manages the heat dissipation very well, the patented gills which is present on the inner side of the faring does a very good job. The gearbox is a clunky one, you can hear a immediate clunk once you shift to 1st from Neutral. The gear shifts are of mixed nature, some bikes have really smooth shifts and some are really hard. 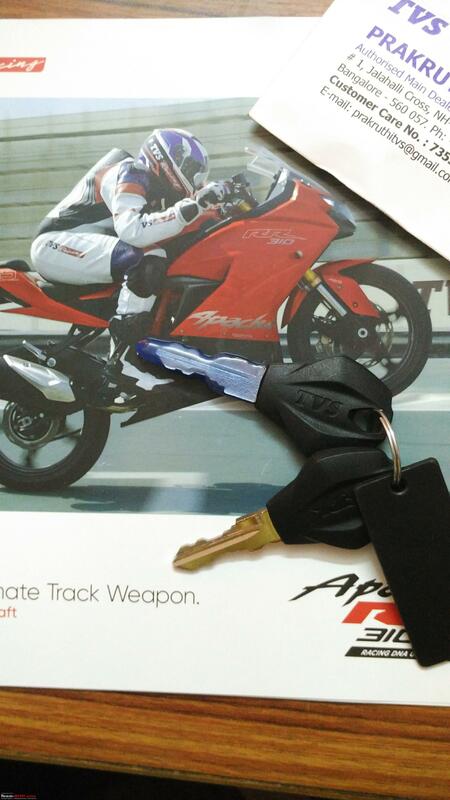 Although I am not sure if it depends on any kind of adjustments to the clutch cable or chain tightness. My gear shifts are really erratic and it hasn't changed one bit, one also needs to be very cautious in finding Neutral while downshifting. Sintered brake pads are provided at the front and rear from Bybre. The bite at the front is a little less compared to the rear, since I use the front brakes more often I can live with it. A set of sintered front brake pads would cost you around Rs.2236/-, whereas the sintered rare pads is Rs.1050/-. Since many owners complained of high cost for brake pads, TVS has also released cheaper non sintered rear brake pads at a cost of Rs.250/-. I would strictly recommend not to use the cheaper pads for highway or speed runs since the bite is very less compared to the sintered ones. 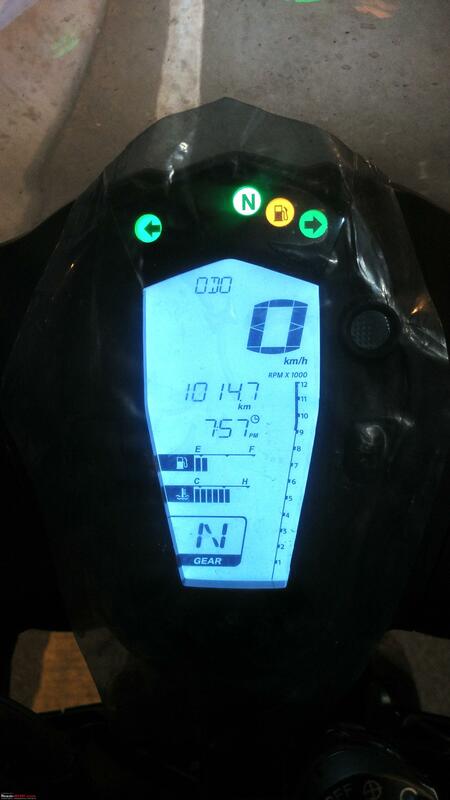 I am still using the stock pads even after 10,000km whereas some have reported pads wearing out at 1,000km itself, it totally depends on the riding style and their is nothing wrong with the brake pads. 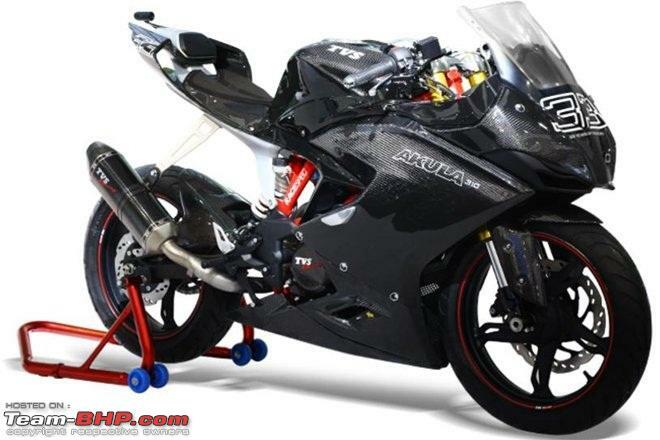 TVS has recommended Motul 15W50 3000 SM Engine oil for the RR 310, which was used in all my services at the SVC. 1.7ltrs is the engine oil capacity and it would cost you around Rs.600/-. Oil filter costs Rs.270/- and air filter at Rs.350/-. 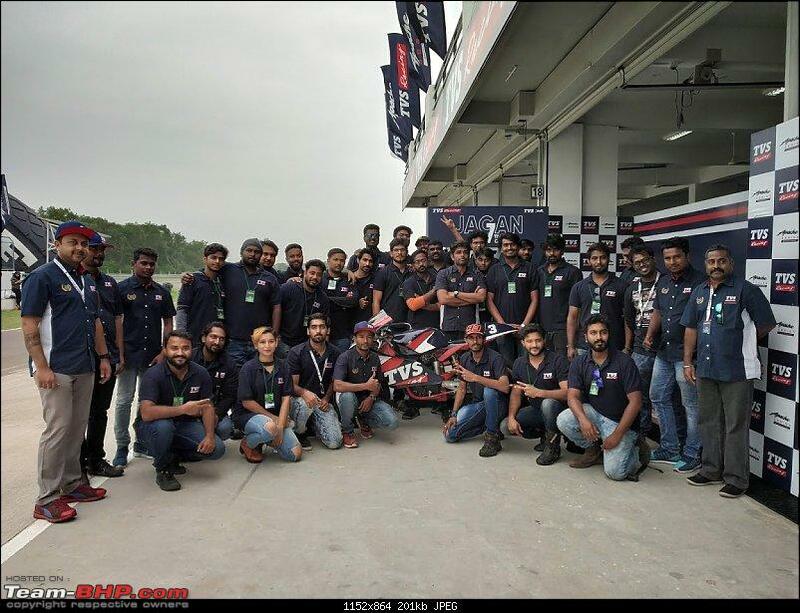 TVS has recently launched Tru4 fully synthetic engine oil for the RR 310 which costs Rs.1750/- for 1.7 ltrs, which was not available at the Bangalore SVC when I did my 3rd service at the end of January. My next shift will be to the fully synthetic engine oil. The body panels have been neatly designed, but the fit and finish is not that great. 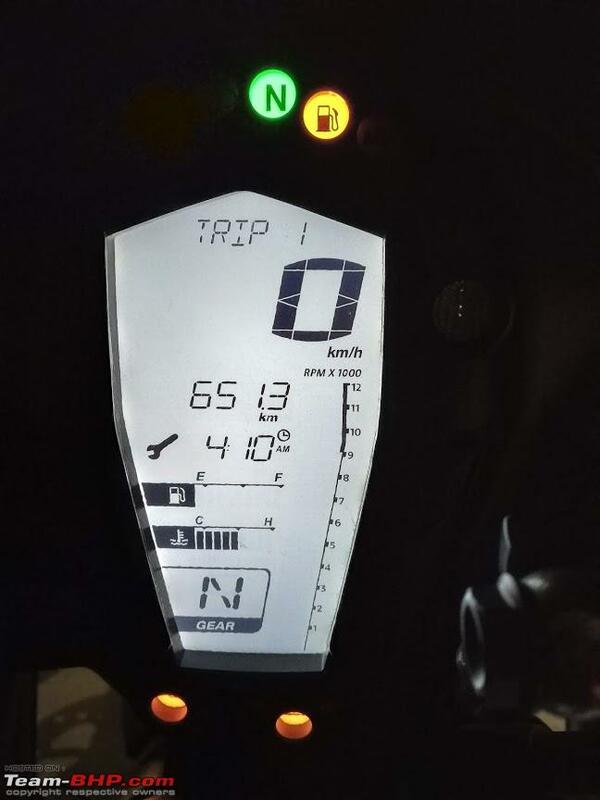 The tank panels and the tail piece squeaks when pressed hard from Day 1 even till today, no solution has been provided even after a meeting with the Technical Engineer from TVS. I checked out the new lot bikes at the showroom to see if the issue still persists, but it is the same story on the new bikes too. Paint chipping has been reported in the group especially on the master cylinder and the mirror stem. 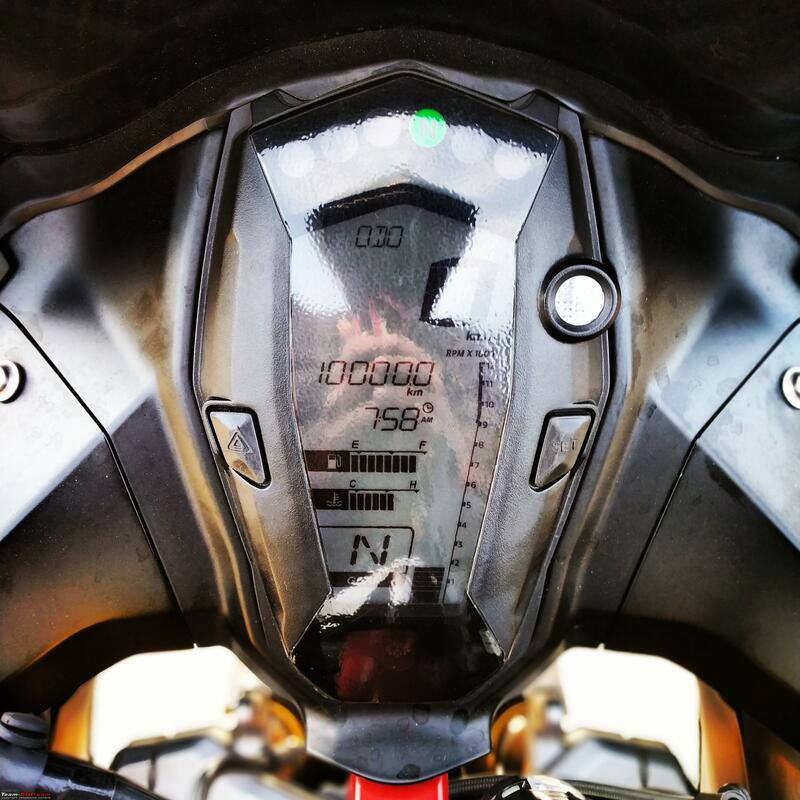 I have recently found a couple of days back that there is some sort of air bubble formation on my right fairing. I have escalated this to the SVC, waiting for a solution. 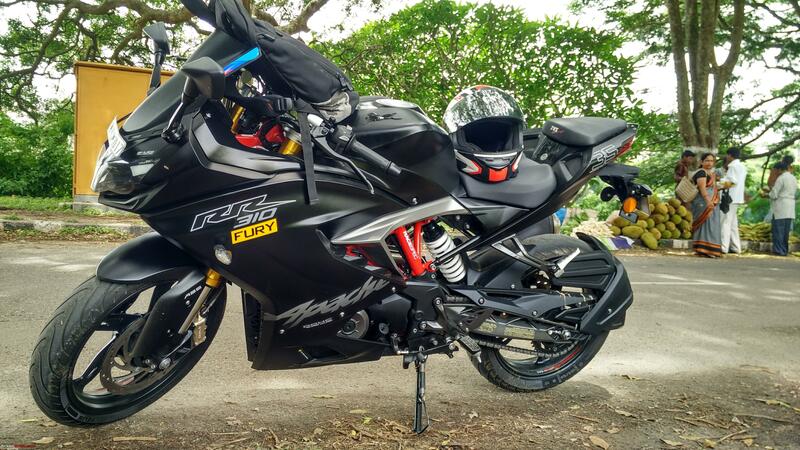 Suspension duties are taken care by a USD fork in the front and a adjustable monoshock at the rear,both from KYB. The USD's are chunky and the gold finish on them is excellently done and stands out. The rear suspension is pre adjusted and I feel it is a bit hard over bumpy roads, maybe I should try adjusting it to a different setting. I personally did not find the design of the alloy wheels very appealing, there is nothing extra ordinary about the design. The matte finish on the alloy is excellent and there is no scratches or paint chipping visible, but it is very difficult to maintain the cleanliness of the alloys since it attracts a lot of dust. The Michelin Pilot Street Radials provide a good amount of grip both in wet and dry conditions, although one most compromise on cornering speeds. I find these tyres perfectly suitable for city & highway rides given it's durability compared to what the competition offers. Following up with my earlier rants on mirrors, the mirrors have actually been designed very cleverly and provides good amount of visibility (Below 100km/hr) behind your back. It is easily adjustable with the help of the mirror stem (This part is a bit hard and requires some amount of pulling), and you can adjust the mirror up & down according to your needs. Frequent complaints to TVS about mirror visibility lead to a replacement of a washer, the thinner washer was replaced with a thicker one at the place where it is connected to the vehicle body. Result: No improvement. 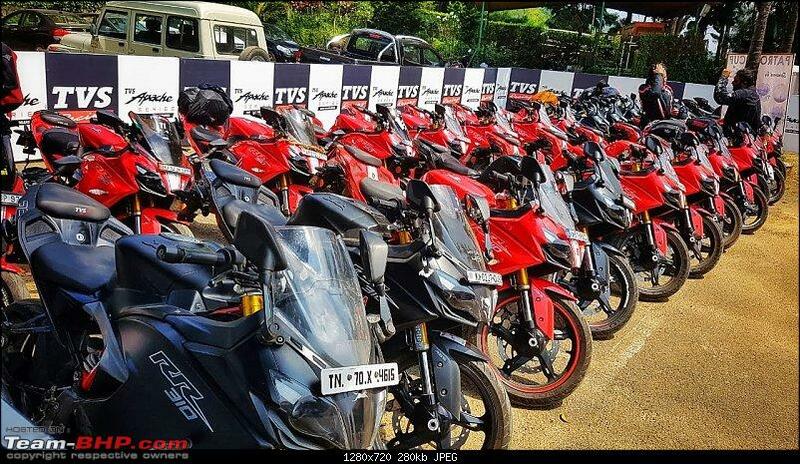 TVS has recommended a cleaning interval of every 500 kms for the chain and sprockets. 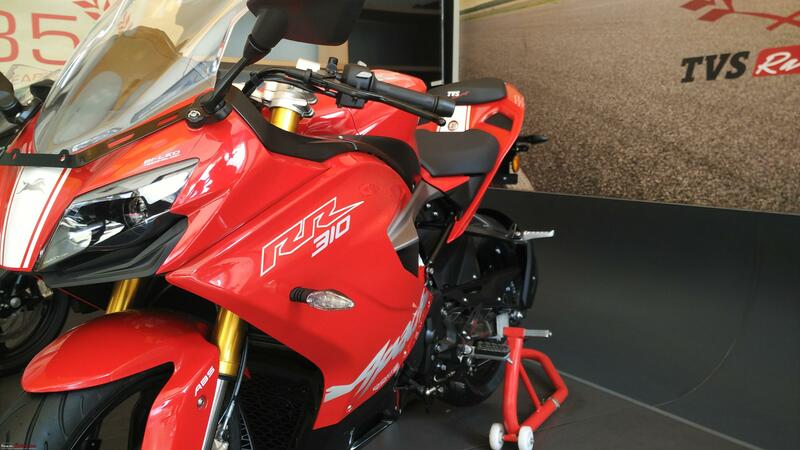 Since the RR 310 has a long swing arm, a roller has been provided to reduce the tension on the chain, just before the front sprocket behind the foot peg. Initial batch vehicles came with a hard compound (Longer life) roller since TVS may have thought people would complain that a roller costs Rs.900/-, this decision backfired when people started to complain about the famous Tak Tak sound when the vehicle runs over uneven surface. 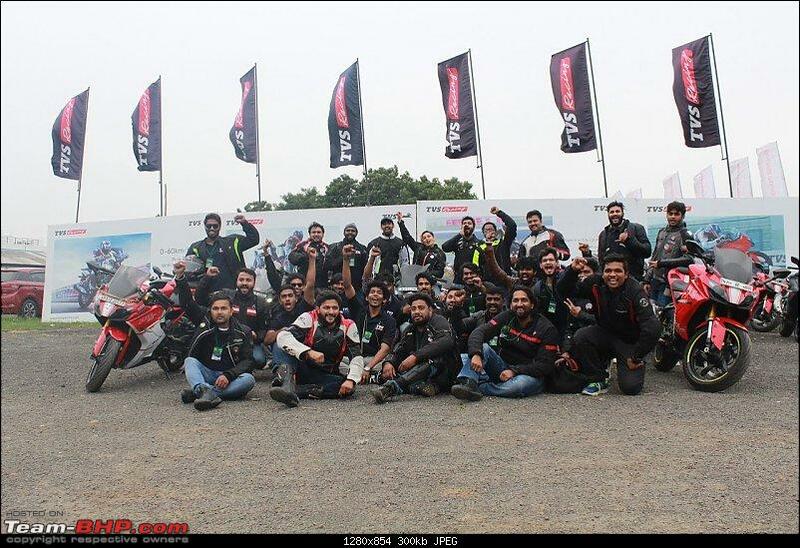 TVS then came up with a soft compound roller FOC for the initial batch vehicles and the tak tak sound issue had been resolved, but by then it was all over the internet and some of the damage had been done. I use Motul C1 & C2 for cleaning the chain & sprockets which easily lasts upto 800 kms. I have a mixed feeling at the end of my 1st year ownership,one can be in awe about the engine performance and at the same time be disappointed about the fit and finish of the body panels. I have had sleepless nights due to the continuous follow up with TVS and the SVC for the updated parts. 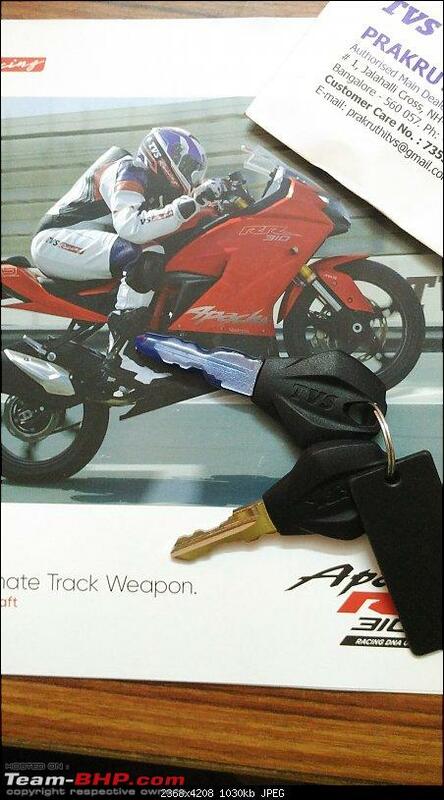 It kinda felt good, since you are doing this in order to maintain your beloved bike. 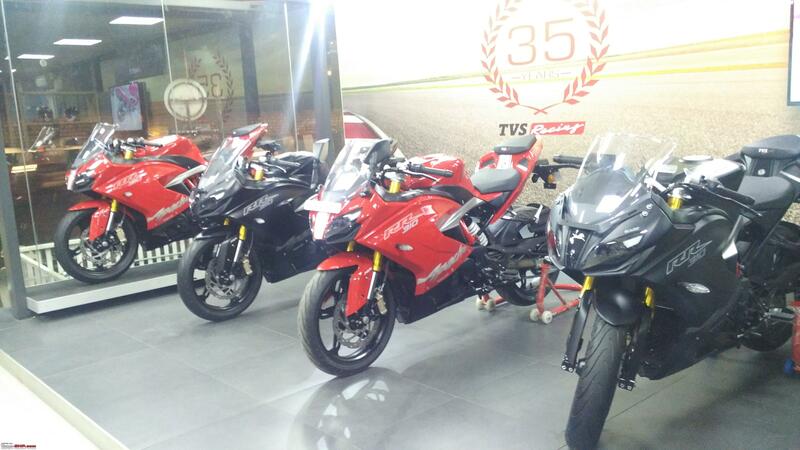 Yes there were initial niggles, but TVS on their part did not let down the early adopters Kudos,to them. The gradual price increase every now and then did not do any good for the sales numbers, but you get a pretty trouble free bike for the extra buck you pay than the initial owners (We call ourselves Paid Testers LOL!!!). I would say the biggest positive of the bike is its engine and the ride quality. 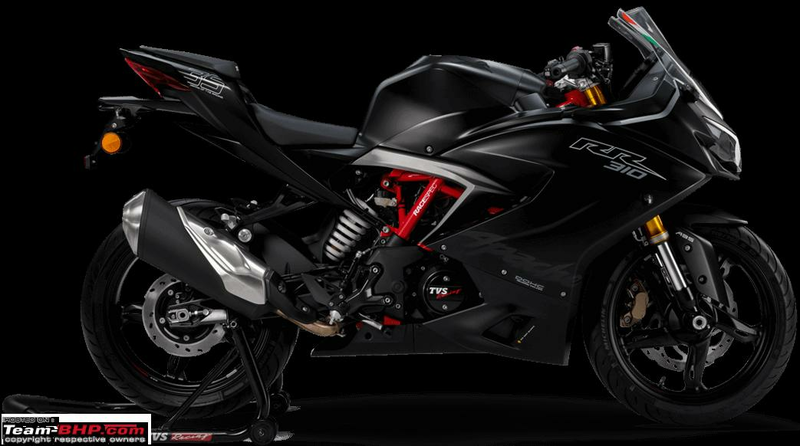 Even though the bike is a looker with it's stunning design, the fit and finish of the body panels could have been a tad better, I mean 2.8L ain't cheap. I am still awaiting TVS to rectify the squeaky tank panel and the tail section on my bike, and I am not sure if they would rectify it after a year of purchase, but still hoping for the best. It has been a trouble free ownership until now with no major mechanical breakdowns (Touchwood), hoping to cover more and more miles on this beauty. Finishing up with one of my favourite picture, which aptly suits the title. 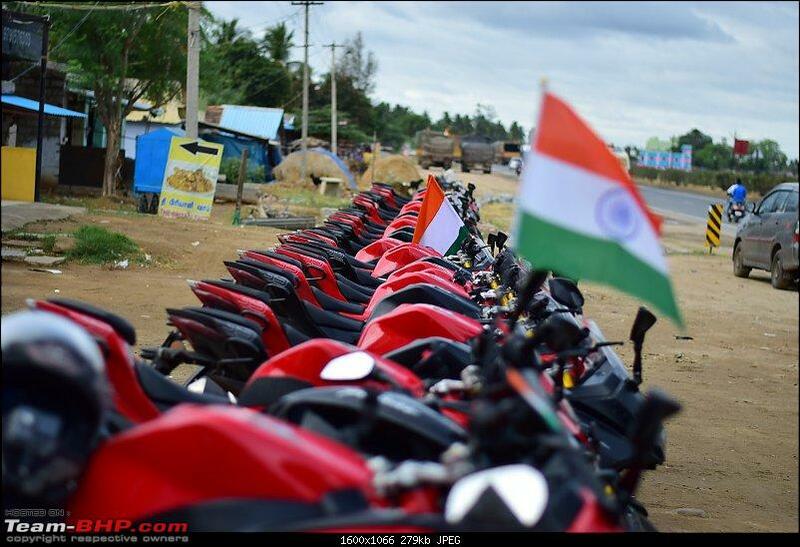 Thank you Mr Suresh Kumar (TVS Motor Company) for your continuous support & for constantly following up for feedbacks. A big thanks to Mr Shashi AKA Doctor (Prakruthi TVS) for the service support provided to the group. Last edited by GTO : 5th February 2019 at 07:28. Reason: No illegal speeds please :). Thanks for sharing this review! Thread moved from the Assembly Line to the Motorcycle Section. Thanks for sharing! No not the #46 but someone older and wiser, Casey Stoner and his taunting red Ducati. Ah! Sir! I see you're a man of superior taste as well! 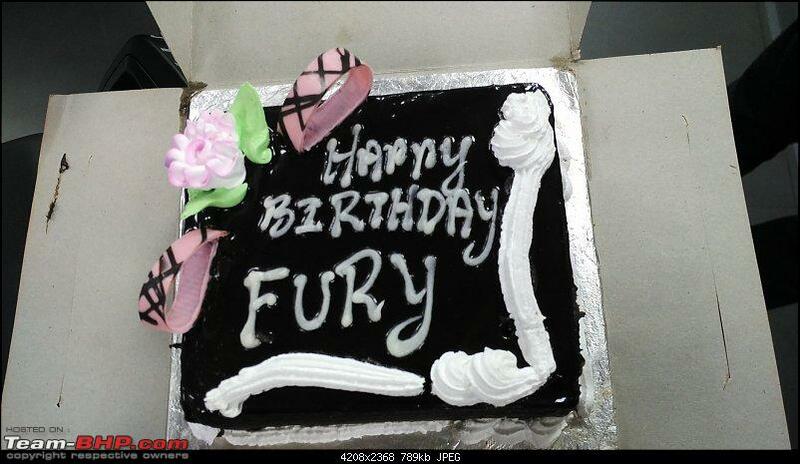 Really nice write-up about Fury, do hope you cover many more miles and do keep us updated. Beats the Interceptor hands down...!!! Ayyo, so a single seater, slightly vibey and a few rattling panels, so does it beat the Interceptor?? Congratulations on the detailed review which is equally exciting to read. The Yays and Nays have very succinctly been explained and clarified, and will go a long way in helping a lot of people make their decision. Happy Riding and be Safe will ya. Very well written Ranjith, and some nice pics too, refreshes few memories. 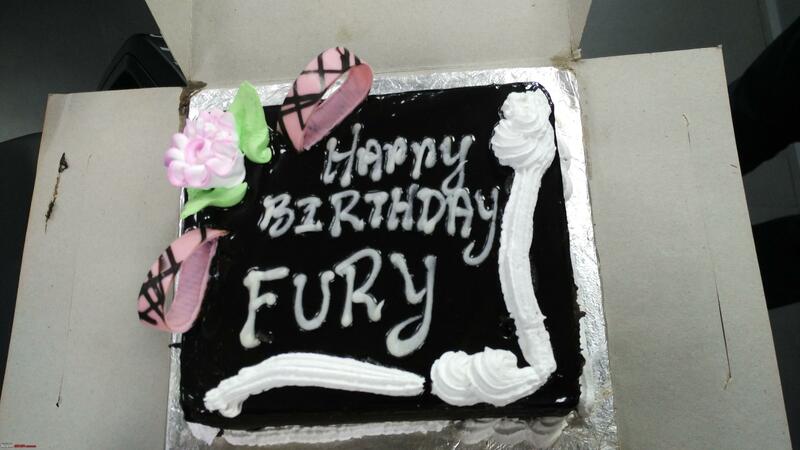 Wish you and Fury millions of safe riding. Thank you GTO, today is the 1st year anniversary of the bike and it feels good to have the thread on Tbhp. Hahah I knew my post on Stoner would wake you up. Thank you so much for the wishes, I will keep it updated with upcoming services and travel stories. 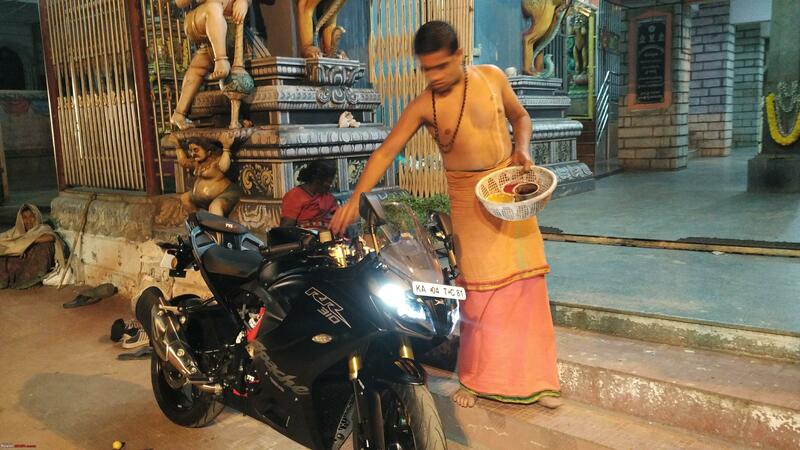 I must say that TVS has really improved the vibes and panel issues in the 2019 bikes just to add to your confusion. Thank you so much, this means a lot to me. NOTE FROM T-BHP SUPPORT: Merging back-to-back posts. Please use the QUOTE+ functions to address your reply to multiple members instead of submitting one post after another. Also, only TWO emoticons allowed per post. Please read the Announcements carefully before proceeding. Last edited by suhaas307 : 5th February 2019 at 13:08. Reason: Merging back-to-back posts. Please use the QUOTE+ functions to address your reply to multiple members. Thanks for this thread, I'd been wondering about the 310's for awhile. The RE twins are undeniably a great value right now and pose a real challenge to many a manufacturer in this price range; but of course this is an entirely different sort of bike, and seems quite a good one for a lot less money than BMW's getting for their badge. Last edited by ringoism : 5th February 2019 at 17:32. This is one motorcycle that can do it all. I would definitely like to own one. It is glad to hear TVS are proactive in solving minor issues. Looks great in matte black. However, I have always felt that matte colors are difficult to maintain in Indian conditions. Did you face and problems related to that? 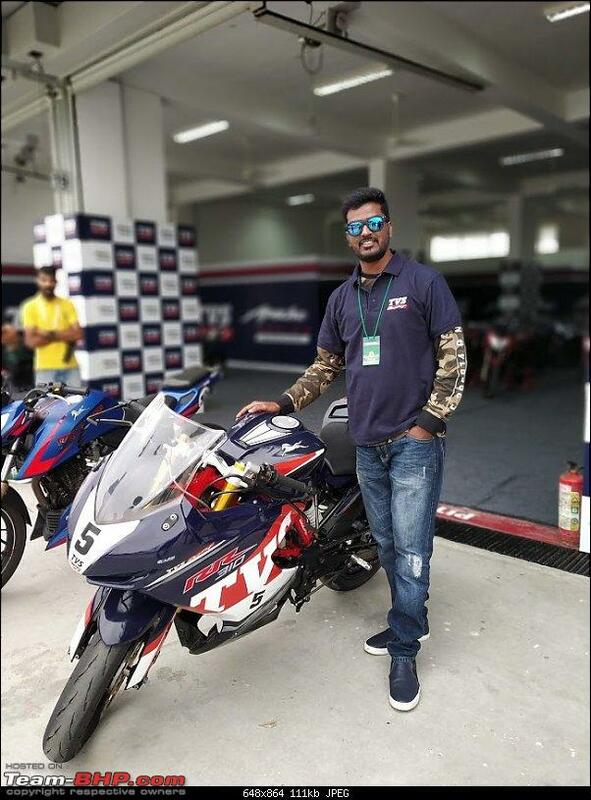 I wish TVS comes up with a version with their cup bike livery and one in white color as well. By the way have you watched the animation movie "How to Train Your Dragon" ? The Heros Dragon is of the "Night Fury" type and somehow your Fury reminds me of that in a nice way. Fully-faired small bikes always seemed a bit poser-ish to me being that the fairings do very little functionally at these speeds; also cost a lot whenever the bike's laid over..
Basically you only have two options to choose from, it's either a naked or a fully faired bike. Since I plan to tour a lot, a fully faired bike would excel in protecting me from windblast and also provide much more stability at high speeds. Yes, things do get a bit messy when you crash. But hey what is life without compromise?? I am not sure even if TVS has plans to bring in an ADV on the same platform, but I have heard news about a naked 310 being sketched up. 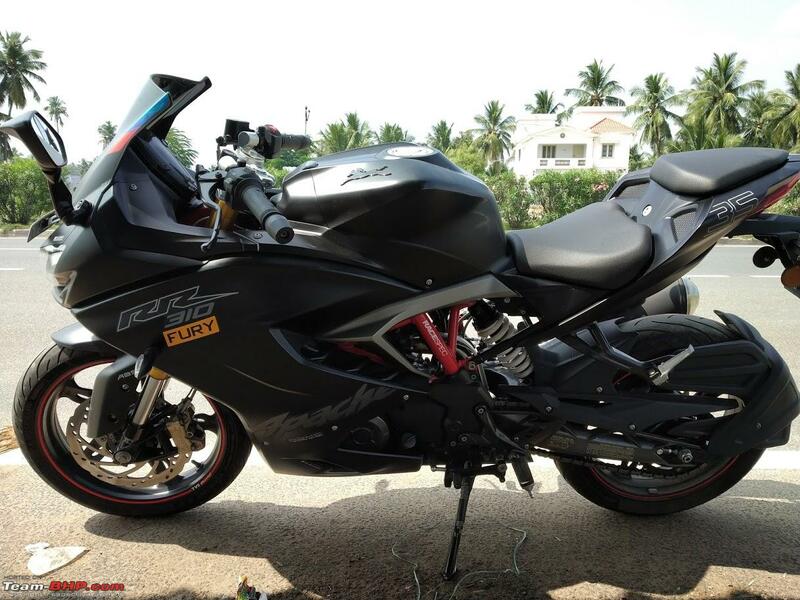 Thank you puneeth2, the bike in black is underestimated according to me. I wish TVS could have planned a shiny black rather than matte. The matte needs extra care since it easily gets dirty and one needs to be cautious while cleaning the bike. The type of cloth, foam and even the water type matters. Hard water has a tendency to form white crystal like substances in the gap between fairings (Personal experience). The race cup livery was a one off design for the final race of the season. But you can get the same design wrapped from a local shop outside. Thank you r_nairtvm, I am a fan of animated movies and have seen the movie. 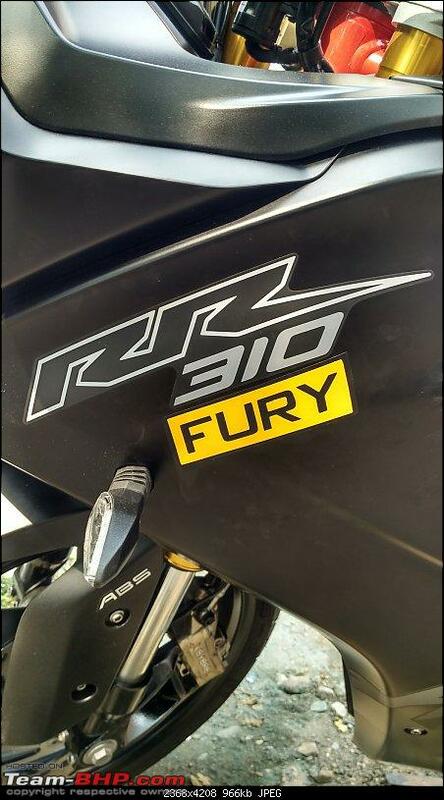 The headlight area along with visor has a close resemblance to Night Fury, but since the name was too long to design a sticker, I cut it short to Fury. 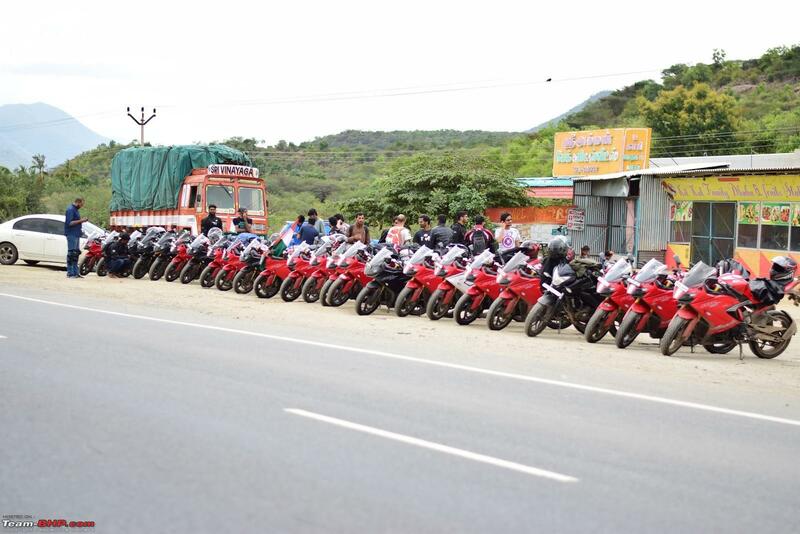 The bike has massive road presence, the low sales number ensure that you don't get to see much of these on road. I recently spotted one in red color and I was astonished by the size of it. It is almost as big as Superbike. I absolutely love this particular Apache, I have always been fan of these Race Replica faired bikes. If I were in market for this the only thing holding me back would be the RE Interceptor, that additional cylinder at a marginal incremental cost is just too hard to ignore. Anyway, happy riding to you, be safe, be alert.